These plates are used on trucks which operate interstate. Before the establishment of the Interstate Registration Plan (IRP), commercial trucks over 26,000 lbs which operated in more than one state had to display a plate from each state which they traveled in. Eventually, in the western states, "waffle plates" or "bingo cards" were used. These were license plates which were divided up into a number of small boxes. When a truck was licensed to operate in a particular state, a decal from that state went into a box on the plate. This made the front bumpers of the trucks much less cluttered. Once the IRP was established, and as the various stated joined the program, "Apportioned" plates were issued by the states. These indicated that the registration fees for that truck were apportioned amongst the states in which the truck traveled. This type seems to have started in Connecticut in the mid-1980s, in the 1000-A series. Eventually the numbering format moved to 12345-A. Apportioned trailer plates were also issued early on in a 1234-AT format. 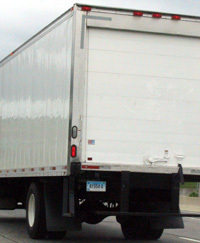 However, since the IRP does not specifically require apportioned registration of trailers, this type is no longer issued. Some plates of this type were re-made on the graphic base during the general reissue in 2000; though these are even rarer than the original series. "Low-number" apportioned plates have been sighted on the roads lately (e.g. 8-A), and these seem to have been issued to "connected" companies. This is an example of what has happened to many of Connecticut's new plates - after only a few years the background turned from blue and white to blue and brown.